Regency Plastics takes pride in providing our customers with a turnkey solution for technical blow molded products. Moreover, our ISO 14001:2015 and IATF 16949:2016 certifications demonstrate our commitment to quality blow molding. If you’re looking for a company that can help you take your blow molded product to the next level, we invite you to tour our 102,200 square foot facility, located in Ubly, Michigan. You’ll see first-hand how our team is leading the industry in the development and production of over 200,000 technical blow molded products each year. And if you can’t make it to Ubly anytime soon, check out our Regency Plastics video, which is just like being in the plant with the people who make it all happen! Drawing from centuries of combined experience and armed with state-of-the-art equipment and technology, Regency Plastics helps customers achieve the best blow molding outcomes possible. 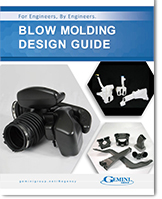 With in-house tooling and engineering capabilities and through horizontal integration, we are able to help customers drive cost out and decrease lead times up to four weeks compared to incumbent blow molding companies. From development to material selection to prototyping to tooling to production to testing; the blow molding manufacturing experts at Regency are here to assist with your project in any way necessary. Work with the best and realize success! Start the conversation today!